Rich Fahle is an occasional guest host for the National Writers Series, including authors Jamie Ford, Kelly Corrigan, Rita Mae Brown and Nathaniel Philbrick. He’s also one of the organizers of this year’s Midwest Literary Walk, held on the last Saturday in April in Chelsea, Michigan. The Midwest Literary Walk is an annual spring literary event held in downtown Chelsea, Michigan. This year’s event is on Saturday, April 25. Now in it’s 7th year, the mission of the event is to highlight the power of literature and poetry in everyday life, with a special focus on authors, poets and playwrights with a connection to the Midwest. For book lovers throughout the region, the Midwest Literary Walk offers a full day of literary tourism, blending nationally renowned writing voices with Chelsea’s quaint downtown. For those who haven’t been, Chelsea is a picturesque destination community located 15 miles west of Ann Arbor – and is the home to another well-known Michigan cultural institution, The Purple Rose Theatre Company founded by the actor Jeff Daniels as well as The Common Grill restaurant, rated one of America’s top restaurants by Zagat. The event is sponsored by The Chelsea District Library, which has created a model for small libraries all over America and was named the Best Small Library in America in 2008 by Library Journal. 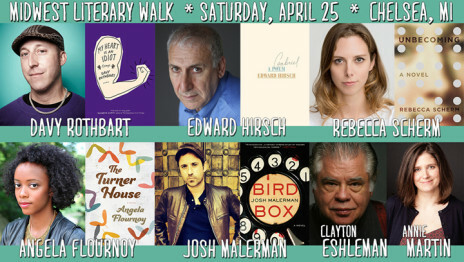 The events of the Midwest Literary Walk take place at various venues and stages throughout downtown Chelsea, each within a block walking distance from one another, allowing visitors and attendees to stretch their legs between events and enjoy the southeast Michigan springtime. Josh Malerman, a Royal Oak native, is the author Bird Box, which was released in 2014 to starred reviews. Also the lead singer and songwriter for the popular rock band, The High Strung, the accolades keep coming for Malerman the novelist—Bird Box was just nominated for the iconic 2015 Bram Stoker Award for Superior Achievement in a First Novel. Said Publisher’s Weekly of Bird Box: “The author uses understatement and allusion to create a lean, spellbinding thriller that Stephen King fans will relish.” High praise, indeed. Angela Flournoy’s debut novel, The Turner House, is a wonderful Detroit family epic telling the story of the the 13 Turner family siblings who’ve come together to decide the fate of the home they grew up in. Publisher’s Weekly named The Turner House one of the Spring 2015’s Anticipated Debuts and said “Flournoy set out to explore the past not only through the lens of Detroit but also through that of spirituality. Ghosts—or, as they’re referred to in the book, “haints”—are a major motif in The Turner House.” A graduate of the Iowa Writers’ Workshop, Flournoy was raised in Southern California but spent her youth visiting her grandparents in Detroit. Annie Martin is an award-winning, Michigan-based playwright with numerous plays professionally produced and read across the state. Martin teaches workshops and speaks to students all across the state about theatre, playwriting, and writing. She also works as a senior acquisitions editor at Wayne State University Press in Detroit, where she developed the award-winning Made in Michigan Writers Series, dedicated to highlighting the works of distinguished statewide writers that showcase our region’s diverse voices. Clayton Eshleman is one of America’s foremost translators and poets. Eshleman held teaching positions at institutions including the California Institute of the Arts and Eastern Michigan University, where he is professor Emeritus. Eshleman’s translations of literary giants such as César Vallejo, Pablo Neruda, Aimé Césaire, Antonin Artaud, Michel Deguy, Bernard Bador, and Arthur Rimbaud have earned him numerous awards, including the National Book Award in 1978. Come visit and enjoy the day! For more information, including times, locations and maps, visit the Midwest Literary Walk website.